In the world of nonverbal communication few expressions are more powerful than a sigh. My mother was a prolific sigher. I could hear her deflated expressions of resignation a mile away. A mom sigh was just a muted way of saying, “All hope is lost. 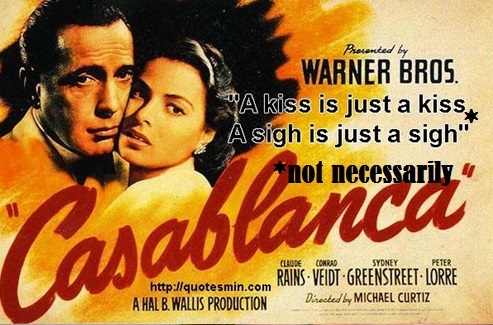 Bring on more disappointments.” Her sigh was also functional. It signaled me that something was up and I would ask if there was anything I could do to turn the tide of impending doom. Researchers tell us that a sigh is almost always the expression of a negative emotion like frustration, despair, longing or loss. True, but occasionally a sigh is positive. There is a sigh that bespeaks the person’s determination to accomplish a goal. The “take-a-deep-breath-and-do-it” sigh is the other side of the “we’re doomed” coin. I hear a lot sighs in my counseling office. One sigh in particular is a fairly reliable measure of a person’s relational maturity. When I hear this sigh from an adult in marital counseling, I know we’ve got a long road ahead of us. I call it the do-I-have-to sigh. When my kids were little the do-I-have-to sigh usually followed a parental request/command. You know the routine: Parent says to child, “Your bedroom is a mess. Clean it up.” Child responds, “SIGH. Do I have to?” My kids can tell you how well that little invitation to negotiate worked in our home. Most people eventually grow up and learn that life is not all about their schedule and their wants and their comfort and their timing. Other people’s requests count and love involves setting aside one’s agenda to meet someone else’s legitimate needs. Mature people view loved ones requests as opportunities to demonstrate how much they care. The do-I-have-to of childhood hopefully turns into the do-I-get-to of adulthood. Do-I-get-to recognizes that it is truly more blessed to give than to receive. And it also affirms another time honored saying: “Actions speak louder than words.” I can say I love you all day everyday but if I automatically exhale a do-I-have-to whine when asked for help, you will naturally doubt the sincerity of my words. Marriages that are characterized more by do-I-have-to than do-I-get-to are predictably unsatisfying and bitter. The same holds true in our relationship with Christ. If my worship or service or devotion is mostly a duty bound do-I-have-to then I have truly missed the heart and soul of the gospel. Lord help me if I lose the gratitude that I feel when I-get-to serve the Lord in missions, I-get-to teach Sunday school at my church, I-get-to worship with other believers and I-get-to read God’s Word in my own language. Final thought: Can you imagine God listening to your prayer requests with a do-I-have-to sigh? Or as the plan of salvation was determined in eternity past, can you honestly hear the Son whining, “Do-I-have-to leave Heaven to live in a 1st century world and die on a Roman cross for those people’s sins?” Or when you confess your sins, could you ever envision the Lord reply, “Sigh. Not again. Do-I-have-to forgive you when you’re just gonna do the same thing again in the next 24 hours?” Nope. I cannot picture any of that. Think about the joyful willingness of Christ next time a loved one makes a request or has a need. You are deeply blessed to have loved ones in your life that you-get-to love in those precious ways. Besides that…it is fortnight. Can you handle fortnight? I hope so. You only get-to do it every two weeks. When we were “newbies” in missions, we counted on the veteran missionaries to teach us the ropes. 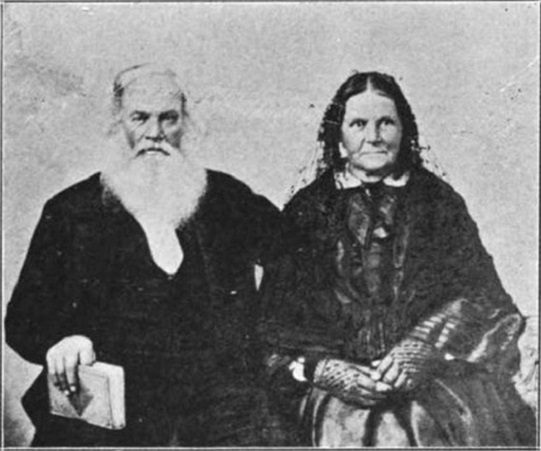 Often, following a disaster or setback, a grizzled missionary would look upon our plight and say, “GMT.” We learned that was short for Good Missionary Training. For example, if you had a low donor month and were unable to buy food for your children, an old timer would growl out, “GMT.” GMT was just a way of telling the new recruits to stop whining and pray. We sure appreciated the encouragement. The following pictorial posting is for new missionaries who need more than hearing someone say”GMT”. This is information that can preserve you through a long missions career. The closest I could come to actual photos of missionaries demonstrating these skills was from “The People of Wal-Mart” website (with the exception of two photos). Not surprisingly, no celebrities were used in the compilation of these lessons for missionary living. 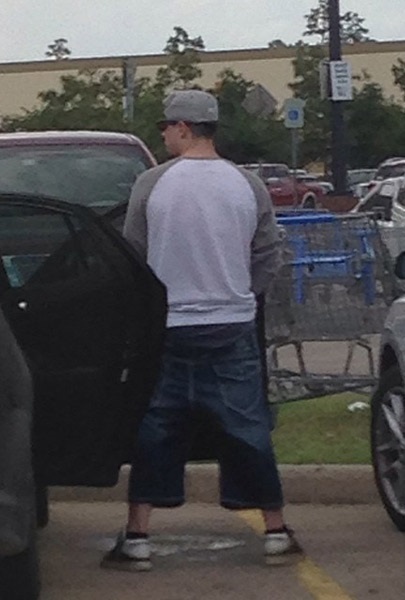 The people of Wal-Mart and missionaries are practically interchangeable. Enjoy the training. Don’t over think the entries. When you’ve been in missions as long as we have, it’s okay to make fun of your own kind. It is one of the few privileges of membership…. One of the absolute necessities for mission’s success is a good “prayer card.” Your prayer card keeps your likeness in front of your donors especially when it is affixed to a frig door with a magnet. The prayer card can have a nice denim theme…as illustrated here. Others have relied on all plaid or stripes or ethic themes. Word of caution: Make sure everybody is fully dressed for the photo. Potential donors won’t say, “Oh look hon, the missionaries need more money for clothes.” If that method worked, you’d see more prayer cards like this one. When you drive up to a church, make sure your vehicle is modest and appropriately crummy. Never too new or nice. Donors don’t like to see their missionaries or pastors in decent cars. The above people have the right idea. 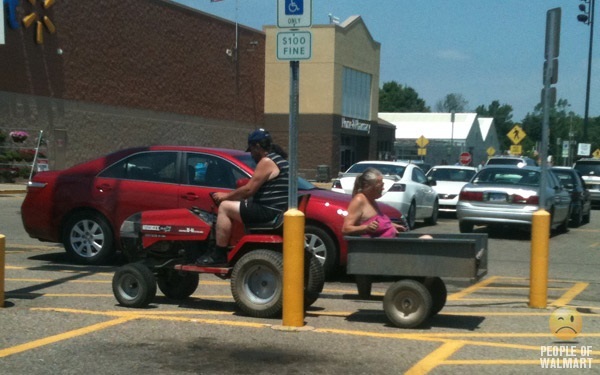 The lawn mower and cart is probably donated. Regular cars don’t fit in the missionary barrel. 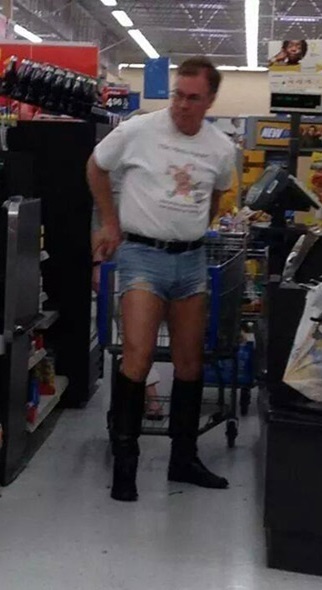 When preaching to an American audience, always wear your “Sunday best”. 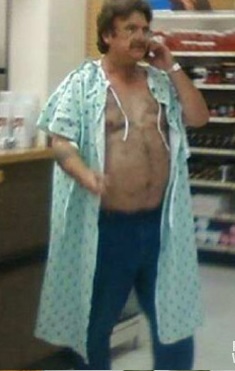 But, that breezy little number you got at the doctor’s office isn’t the best choice. 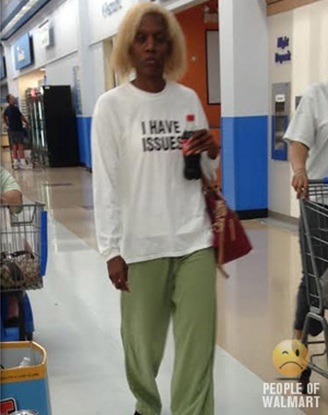 I know: It was free and it is the newest shirt you own. But dig a little deeper in the missionary barrel and come up with something with a collar and buttons in the front. The Christmas prayer letter photo usually has a nice “reason for the season” message. Please remember “The Grinch that Stole Christmas” is not in the Bible. 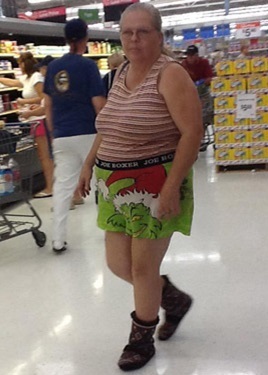 So, rather than wearing Grinch boxers for the photo, try a tacky but seasonally relevant sweater. People may give you money to not wear it again. Supporting churches often ask the missionary to deliver the children’s sermon during the worship service. You may not get much lead time so be prepared. Kids will overlook a boring missionary story if they get candy when it’s over. 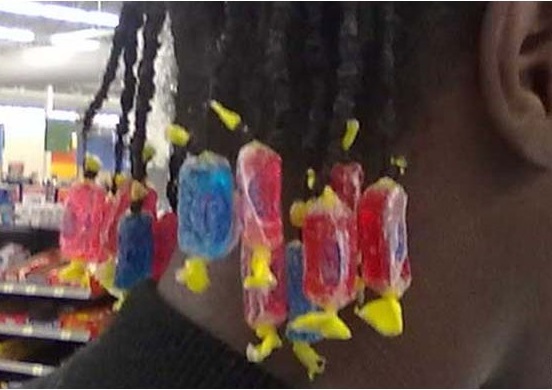 Weaving Jolly Ranchers into your hair is one way to keep the kids on board throughout the presentation. 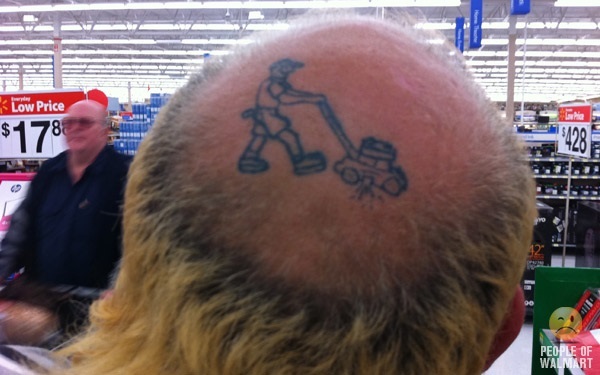 Helpful hint: Go easy on the hair product that day and you’ll be fine. Your donors love to see their missionaries in authentic ethnic clothing. Still, you will want to closely monitor your authenticity with good common sense. Churches prefer seeing you in a grass skirt (that you would never wear) to the boots and shorts you wear every day overseas. Wearing a fur to a supporting church is never okay. Even if you killed the animal in your house on the mission field and have a great story to tell…don’t go there. 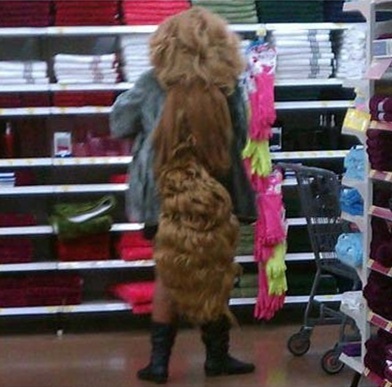 Possible exception: If you can incorporate a beaver or tree kangaroo pelt into your hair style…do it. Nothing says missionary chic like cascading animal hides. Keeping up with fashion trends is hard when you’ve been away for four years. 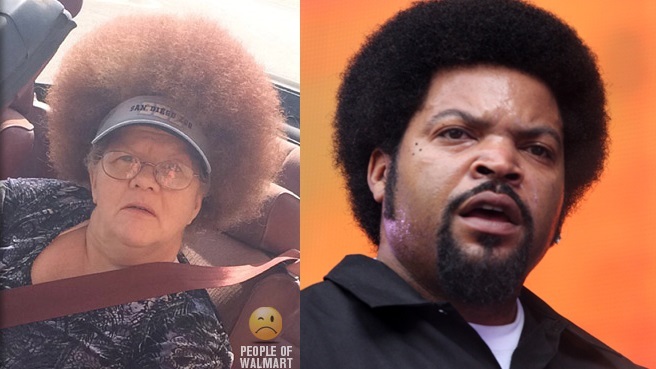 Even though hair styles change while you’re overseas, it is never okay to have a bigger ‘fro than Ice Cube. That is a universal missionary axiom going back to Hudson Taylor. Trust me. Supporting churches don’t mind if you’re honest and vulnerable about your struggles during that last field term. Nobody is expecting a missionary to be perfect. But it’s not a good idea to advertise that you’ve got issues. 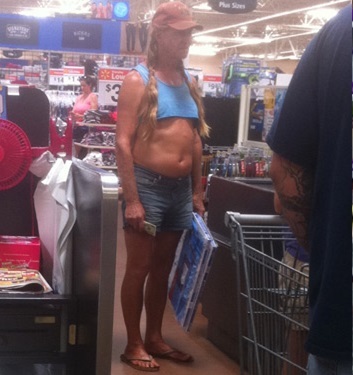 Most people will notice your sketchiness without the T-shirt. 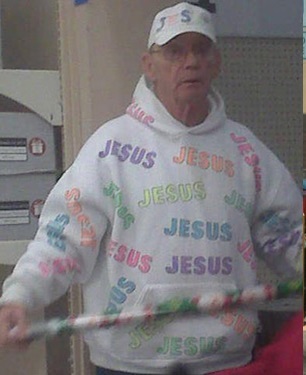 Oh my…the all Jesus hoodie and cap is a bad idea. Who could possibly criticize you for being so bold and up front about your faith? Well…everybody. Please don’t put this outfit back in the missionary barrel for someone else to take. Dispose of it discreetly. Thank you. When you are given a “mission minute” in a morning worship service please keep it short. You ruin it for the rest of us when you go past your allotted time. Less is more when you’ve been given valuable pulpit time. Think short and you’ll be fine. Waste not, want not. If one of your boots is worn out you are NOT allowed to throw away the pair. 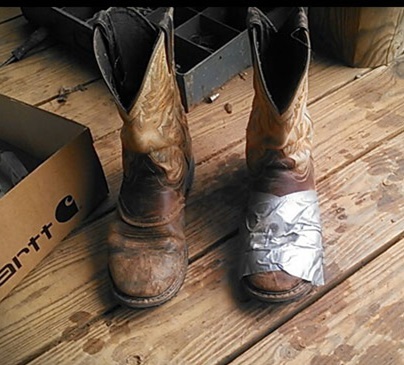 The other boot is probably fine. Missionaries are called to a life of austerity. Before you ask for a “raise” in donor support, make sure you’ve done your part as a good steward of the Lord’s bounty. Strangely, most churches in the USA have working indoor plumbing. Getting “squared away” before you speak to that Sunday school class doesn’t need to happen in the church parking lot. Simply ask one of the local people for the location of the water closet or dunny and enjoy the response. Uh oh…another missionary fashion error. Of course you want to look elegant and in style when you speak at the ladies’ prayer breakfast. 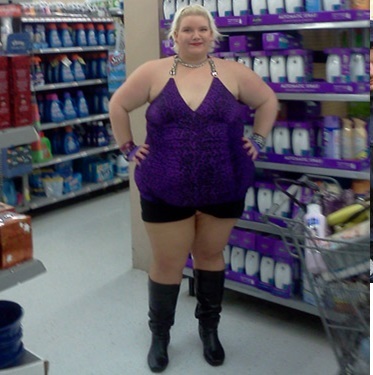 But looking like Barney’s prom date is not gonna get you a hefty love offering. 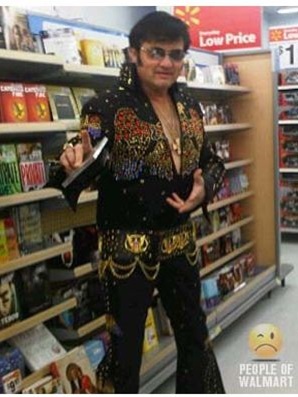 The Elvis impersonator look doesn’t even play well in Las Vegas churches. When supporting churches talk about The King, the reference is always about Jesus. That doesn’t mean you can wear the all-Jesus hoodie and ball cap to a covered dish social. Khaki’s and a polo shirt…even though really vanilla…will generally stave off fashion Armageddon. 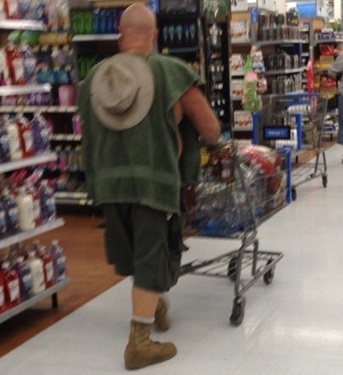 And finally, just because you can make a vest/poncho out of a towel doesn’t mean you should. Those disposable hotel shower caps, airline eye masks, and paper hospital slippers in the missionary barrel are not for your daily use. Just send your thank you notes and file that stuff away with the used tea bags.